The Legend of The Cape May, NJ "Diamond"
My husband and I are lucky to live so close to Sunset Beach, located at the southern most tip of New Jersey, were we fish and pick up "Cape May Diamonds" on the beach. In one day we gathered 3 pounds and brought them home, and even caught a fish in the process. When we got them home, we polished them even furthur by adding them to our rock tumbler. They are pretty. Below are pictures of me on the beach gathering up "Cape May Diamonds", just click on the arrows to view the pictures. Also, my friend Mrs. Octpus, underneath the pictures, will explain this century old legend. If you ever get a chance, come visit the most southern part of New Jersey, and gather up some "diamonds" and visit the Cape May Lighthouse, (picture below). 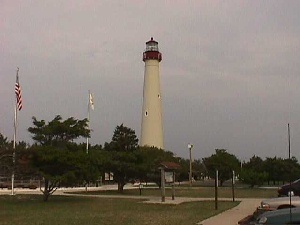 At Cape May Point was the tribal headquarters of the Kechemeche Indians, a component part of the Lenni-Lenape Council. These Indians were blood affiliates of the Algonquin Nation, a peace loving tribe of aborigines. 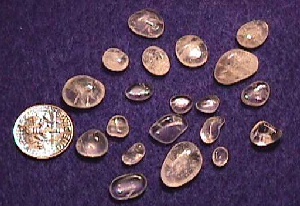 The Kechemeche were the first to find the beautiful translucent stones known as "Cape May Diamonds." The gems were found in limited areas on the beach along Delaware Bay. These gems were held in high esteem by the Indians, who attracted mystical powers and a scared trust to their possession. The Kechemeche believed these curious stones possessed supernatural powers, influencing the success, well-being and good fortune of the possessor. The bonds of friendship and lasting good will were often sealed with the gift or exchange of these beautiful sacred gems. This was especially true of those gems which were larger and free of any flaws. One of the largest "Cape May Diamonds" was presented to an early settler, Christopher Leaming, by King Nummy, last chief of the Lenni-Lenape. King Nummy received the gem from the Kechemeche as a tribute to him and as proof of their faithfulness and loyalty. Mr. Leaming had the stone sent back to the old country. In Amsterdam, Holland, a lapidary expertly cut and polished it into a most beautiful gem. These beautiful gems we know as "Cape May Diamonds" are pure quartz crystals, thrown by tides to appear as pebbles on the beach. Quartz is the most comon of minerals, coming in a variety of colors. The source of the "Cape May Diamonds" is the upper reaches of the Delaware River, some 200 miles upstream, where for thousands of years the swift waters have eroded away pockets and veins of quartz crystal. Then begins the long journey to the ocean, taking thousands of years to complete. Upon reaching the mouth of the Delaware Bay, some 17 miles across, they are propelled swiftly. This is because the belly of the Bay is 26 miles across, causing a strong flow on both incoming and out going tides. This strong flow comes against the sides of the concrete ship "Atlantus", which swirls the quartz pebbles ashore, along with other material, including fossil sharks' teeth and Indian arrowheads. The larger stones come ashore mostly in the winter months when the surf is considerably stronger, particularly during storms. The "Cape May Diamond" comes in a variety of sizes. Finds as large as eggs have been reported. On one occasion, a gem weighing over one pound was found. When polished or cut and faceted, these gems have the appearance of a genuine diamond. When finished, "Cape May Diamonds" can be mounted in gold, silver or platinum, creating beautiful jewelry items. Before the advent of modern gem scanning equipment, many a pawn broker was fooled by a "Cape May Diamond." The "Cape May Diamonds" are found in abundance along the beach in historic Cape May Point. From early Spring until late Fall, visitors come by the thousands to collect "Cape May Diamonds," fossils and Indian artifacts in the shadow of the concrete ship "Atlantus."